"Deep in the Nevada desert, there are many secrets hidden from view. Many stay buried for a long, long time. Captured from some far flung galactic civilization that came to explore our world (and maybe take a few cattle along the way), this craft represents the pinnacle of captured A.E. (alien equipment) that the government forces have so far obtained. 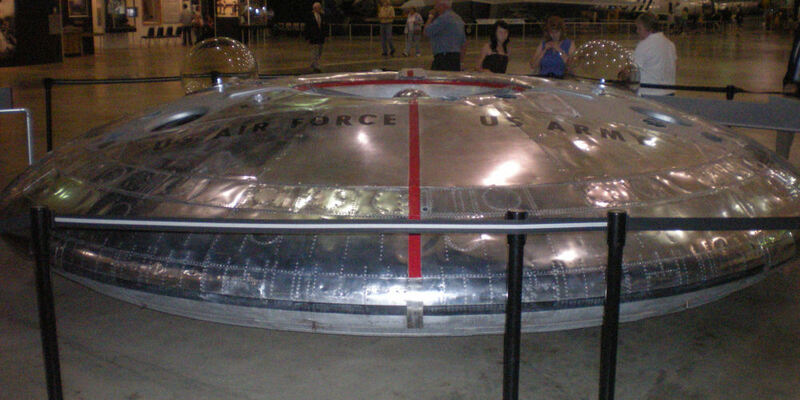 Launched from hidden mountainside hangers that connect to the larger underground bunker complex of Area-51, this craft makes regular sojourns across the deserts night skies. Capable of supersonic travel, the craft also features advanced inertial dampeners that allow it to go from top speed to stationary hover mode instantaneously! Keep your eyes to the sky, as you might just see it for yourself!" Pegasus Hobbies had several interesting kit prototypes on display at the 2008 iHobbyExpo reflecting their entrance into the budget-minded science-fiction hobby market. 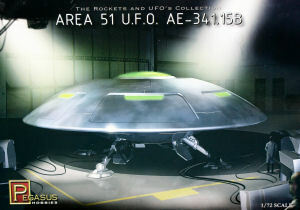 This particular subject of the 'Area 51 UFO' is an interesting example of the creativity coming from this company. 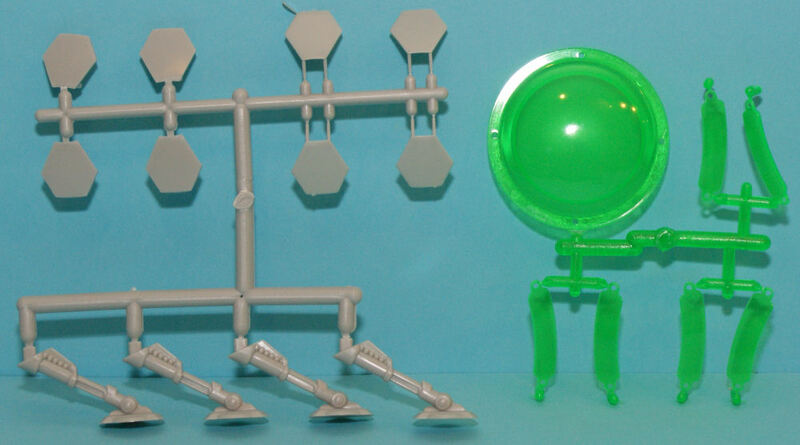 The kit is molded in (alien) gray styrene and presented on one parts tree, plus two disc hull halves and a single clear green styrene parts. The kit is a simple affair with six windows and a central dorsal dome that install inside the upper disc half, mount this to the lower hull, and add the four landing legs and their doors. Two sets of doors are included, one set for gear down, and one for gear up. The model has all sorts of internal lighting possibilities, plus the opportunity for some creative exterior finishes. This kit looked like it might be a fun build-up project when I spotted it at iHobbyExpo and I'm certainly not disappointed with the kit now that it is on the street. 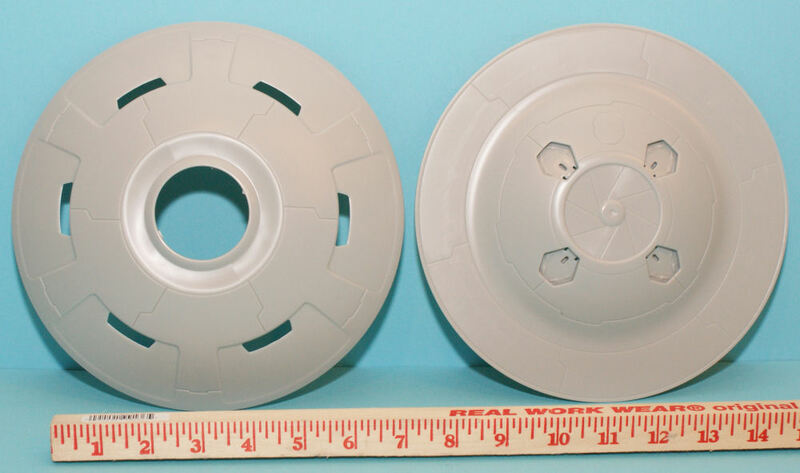 With an MSRP of under $20.00 USD, Pegasus Hobbies continues its tradition of providing interesting subjects at a budget price! Now it is time to dig out the soldering iron and my stash of LEDs to light this gem up! My sincere thanks to Pegasus Hobbies for this review sample!